A pain in the behind. What is it all about and what can you do about it – to ease the pain. Sciatic pertains to the hip. 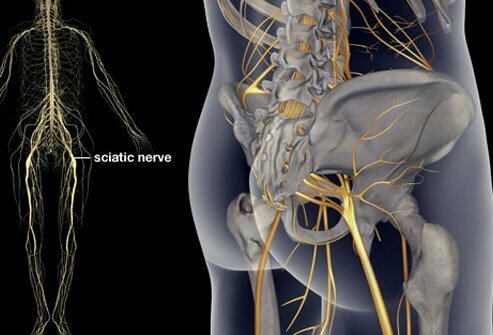 The sciatic nerve is the largest nerve in the body, arising from the sacral plexus on either side, passing from the pelvis through the greater sciatic formen, down the back of the thigh, where it divides into tibial and peroneal nerves. Lesions cause paralysis and flexion and adduction of toes, absuction and adduction of toes, rotation inward and adduction of foot; planter flexion and lowering of ball of foot; paralysis or dorsal flexion and adduction of foot; rotation of ball of foot outward and of raising external border of foot and of extension of toes. Childhood Obesity – is getting out of hand even to the point of being epidemic. Over 75% of adults are obese and the childhood percentage of children with obesity in the US has more than tripled since the 1970’s. Obesity is having excess body fat. Overweight differs from obesity as having excess body weight for a particular height from fat, muscle, bone, water, or a combination of these factors. Something needs to be done about it and it should begin with the parents. Your child should be drinking more water. Eliminate all sodas, and juices that are artificially sweetened, as they cause more weight gain than regular drinks. Bottom line get your child used to water. Eliminate processed and fast foods – which are high in carbohydrates which packs the fat on to your child. I have seen it in my own grandkids and great grandkids. They can eat fruits – grapes seem to be a favorite, and veggies preferably raw. They can eat good fats. Good fats are found in avocados, coconut oil, olive oil, grape seed oil (to mention a few), nuts, and seeds. Vegetable oils and canola oils are not good for your health and should be avoided at all costs. And just so you know – eating fats does not cause you to store fats. The obese train is not the train you want your child to ride. It is difficult to make changes, but the quicker and earlier you make the changes in your child’s life, the better. Over a long period your child will get used to eating healthy and feeling healthy and will more likely make it a permanent change in his/her own life as he/she grows older. Diabetes and Diabetic Neuropathy! The number of Americans, adults and children, that have Diabetes is mind-boggling. It use to be rare to hear of children having diabetes. Today, that is a different story. Diabetes has a down side that people with the disease struggle with – called Diabetic Neuropathy – which can be very debilitating. Diabetic Neuropathy is a progressive disease. It is a complex disease. In short, one has high blood sugar levels, along with low blood and oxygen supply, which damages the nerves throughout the body. This damage “affects the long peripheral nerves that feed sensations to the legs, feet, and toes from the spinal cord, through communication with the brain.” Symptoms include: Numbness, tingling, burning sensations, painful aching, joint inflammation, joint damage, balance issues, skin discoloration and texture changes, muscle cramps, feeling of stiffness and pins and needles. Treatment usually involves prescription drugs and or surgery. Drug therapies do not cure diabetic neuropathy, and again, are highly addictive. Treating the underlying cause of diabetic neuropathy is essential. Lowering your blood sugar level (Alc) and managing it through ongoing maintenance is crucial for your wellbeing. There are two types of Diabetes – Type I, which is usually called juvenile or brittle diabetes, which is insulin dependent. Type II is referred to as ‘late onset’ and is considered non-insulin dependent, but can become insulin dependent. One of the glands involved in diabetes is the pancreas. The pancreas has two jobs to do, first is the secretion of major digestive enzymes, second is the production of insulin by the beta cells for glucose utilization. When the pancreas doesn’t do it’s job, where digestion is concerned, which involves the mouth, stomach, pancreas and small intestines, it results in inadequate bile flow which in turn will inflame the walls of the intestines, which eventually leads to ulcers and intestinal “itis’s”, which goes on and on into other health issues. The function of the pancreas that directly relates to diabetes is performed by the beta cells, which produce and release the insulin that aid in the utilization of glucose fuel by the body. Insulin assists the transport of glucose through cell membrane walls. In both types of diabetes, but especially Type I, the weakness in the pancreas is usually passed on genetically. However, you can create pancreatic weakness yourself by allowing your body to become highly toxic. It may take a long time, even many generations, for a weakness from inflammation or toxicity to actually cause diabetes. The range of diabetes is broad. Diabetes is considered to be another autoimmune problem. The allopathic medical community cannot find a reason for this autoimmune response other than to say it is probably in the genes. A good detoxification program along with cleaning the parasites and flukes out of your body is a good start to combat this disease. Be a part of your own healing. Start Now!